GENTIC DISESES ARE inherited and acquired from genes . we provide solutions for genomic health risks for 100+ conditions. The results provide valuable insight into YOUR genomic predisposition to several health conditions, traits, lifestyle tendencies, drug efficacy, and more, helping you pre-empt a majority of diseases. 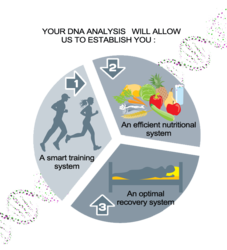 In combination with genomic counseling, this will become YOUR master plan to better health, lifelong. Huntington’s disease (HD) is a fatal genetic disorder that causes the progressive breakdown of nerve cells in the brain. Mutations in the HTT gene (CAG trinucleotide repeat) is known to cause Huntington disease. quick service at low cost! Significance Paternity testing is performed using Short Tandem Repeat (STR) analysis which is used to compare specific loci on DNA from the child and father. Mutations of the CFTR gene dysregulates epithelial fluid transport in the lung, pancreas and other organs, resulting in Cystic Fibrosis. 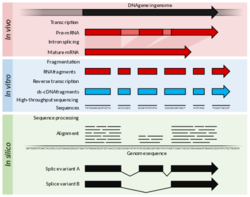 RNA-Seq (RNA sequencing), also called whole transcriptome shotgun sequencing, uses next-generation sequencing (NGS) to reveal the presence and quantity of RNA in a biological sample at a given moment. RNA-Seq is used to analyze the continuously changing cellular transcriptome. Specifically, RNA-Seq facilitates the ability to look at alternative gene spliced transcripts, post-transcriptional modifications, gene fusion, mutations/SNPs and changes in gene expression over time, or differences in gene expression in different groups or treatments. In addition to mRNA transcripts, RNA-Seq can look at different populations of RNA to include total RNA, small RNA, such as miRNA, tRNA, and ribosomal profiling. RNA-Seq can also be used to determine exon/intron boundaries and verify or amend previously annotated 5'and 3' gene boundaries. Recent advances in RNA-seq include single cell sequencing and in situ sequencing of fixed tissue. RNA-Seq is used to analyze the continuously changing cellular transcriptome. Specifically, RNA-Seq facilitates the ability to look at alternative gene spliced transcripts, post-transcriptional modifications, gene fusion, mutations/SNPs and changes in gene expression over time, or differences in gene expression in different groups or treatments. In addition to mRNA transcripts, RNA-Seq can look at different populations of RNA to include total RNA, small RNA, such as miRNA, tRNA, and ribosomal profiling. RNA-Seq can also be used to determine exon/intron boundaries and verify or amend previously annotated 5'and 3' gene boundaries. Recent advances in RNA-seq include single cell sequencing and in situ sequencing of fixed tissue. The Human Genome Project (HGP) was an international scientific research project with the goal of determining the sequence of nucleotide base pairs that make up human DNA, and of identifying and mapping all of the genes of the human genomefrom both a physical and a functional standpoint. It remains the world's largest collaborative biological project. After the idea was picked up in 1984 by the US government when the planning started, the project formally launched in 1990 and was declared complete on April 14, 2003. Funding came from the US government through the National Institutes of Health (NIH) as well as numerous other groups from around the world. A parallel project was conducted outside government by the Celera Corporation,The Human Genome Project originally aimed to map the nucleotides contained in a human haploid reference genome (more than three billion). The "genome" of any given individual is unique; mapping the "human genome" involved sequencing a small number of individuals and then assembling these together to get a complete sequence for each chromosome. 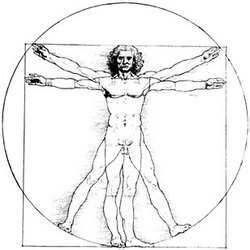 Therefore, the finished human genome is a mosaic, not representing any one individual. Exome sequencing, also known as whole exome sequencing (WES), is a genomictechnique for sequencing all of the protein-coding genes in a genome (known as the exome). It consists of two steps: the first step is to select only the subset of DNA that encodes proteins. These regions are known as exons – humans have about 180,000 exons, constituting about 1% of the human genome, or approximately 30 million base pairs. 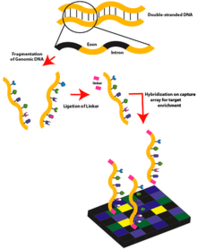 The second step is to sequence the exonic DNA using any high-throughput DNA sequencing technology. The goal of this approach is to identify genetic variants that alter protein sequences, and to do this at a much lower cost than whole-genome sequencing. Since these variants can be responsible for both Mendelian and common polygenic diseases, such as Alzheimer's disease, whole exome sequencing has been applied both in academic research and as a clinical diagnostic.